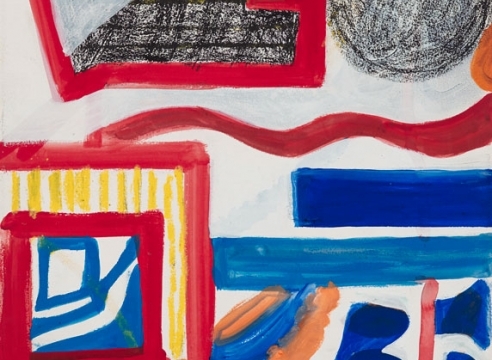 The gallery is pleased to present a forty-year retrospective of works by Paris-based American abstract painter Shirley Jaffe. The exhibition is the artist's third with the gallery. Jaffe's large-scale geometric abstractions are inspired by what she sees day to day in the urban Paris landscape. This vision is translated ultimately into colorful shapes and scriptive lines, set against generous white grounds, creating playful and balanced compositions. Although Jaffe's artistic process usually entails many months of struggle, once the artist locks in the compositions, the seamless matte surfaces of the paintings show no signs of their evolution. 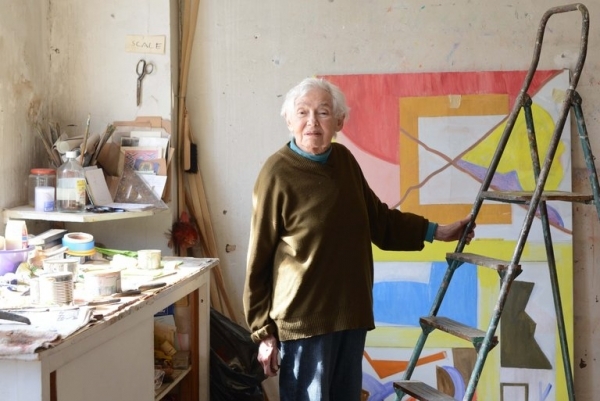 The artist arrived in Paris in 1949; in the decades that followed, Jaffe established herself among a circle of American artists living in Paris including Sam Francis, Ellsworth Kelly, and Joan Mitchell. Jaffe has enjoyed an increasing international following in recent years, and her work was the subject of two major museum retrospectives in the last year. Jaffe's manipulation of the visual takes the basics, lines, forms, colors, and allows them every freedom her extraordinary imagination can devise, while vigilantly suppressing any errant tendencies towards tactile effects on a uniformly flat surface without material density […] Explaining her procedures, she once described how she holds off as long as possible choosing among the "myriad solutions" that occur to her during the making of a painting. In this discovery of her picture in the moments of its execution, she sees herself extending Abstract Expressionism's tradition of considered spontaneity. Among others, Jaffe's work is in the collection of the Museum of Modern Art, New York and the Centre Georges Pompidou, Paris, where one of her paintings was recently included in the exhibition "elles@centrepompidou - Women Artists in the Collections of the Centre Pompidou." The gallery will present an exhibition of the artist's recent work at the ADAA Art Show, March 2– 6, Booth A-12.